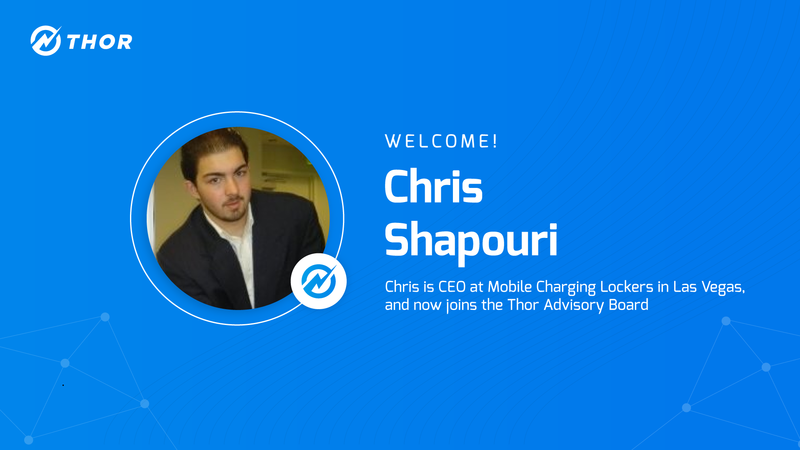 San Francisco, January 30, 2019—Chris Shapouri, Chairman of Las Vegas-based Mobile Charging Lockers, has joined Thor’s rapidly growing Advisory Board. Founded in 2011, Mobile Charging Lockers provides cell phone charging and storage lockers to music festivals, sporting events, outdoor venues, and conferences nationwide. These services are generally provided by a contingent workforce of independent contractors who manage the lockers and charging stations. Since 2011, Mobile Charging Lockers has expanded across North America and partnered with hundreds of hospitality companies and events. Prior to founding Mobile Charging Lockers, Chris held senior positions in a number of companies including working as the General Partner and CEO of Citizen Entertainment Group, Founder and CEO of Teleios Holdings LLC., and as a General Partner with Amero Investment Solutions. Chris has helped take two companies from an idea to a multi-million dollar sale, and he thrives in highly creative fast-growth environments. With 10-plus years of knowledge not only in product development but deployment as well, Chris is primed to help the team achieve maximum success.